This is how I make my AO’s and how I have guided others in the past. This tutorial was supposed to have been done ages ago, but I could never get around to it until now. The new VR Studio has made it an even easier method now with the new libraries, as in the past I would have had to do so with lots of stands. This is how I do it… and is just a suggestion as to how you can make your own unique to you AO by combining the animations and existing AO’s you may already have. As you may know already I love to shoot AO’s for fashion posts etc, so I have a lot of them as sometimes it can be financially viable to buy an ao and get lots of pics out of one animation, than to buy single poses. ANYTHING that is prim that contains items, whether animations/poses, other prims, scripts etc can be unpacked just like a regular box. I have come across confusion on this in the past with customers. Once you have all of the animations you have unpacked, sorted into stands – or libraries – you can then begin the fun stuff. For me this gets easier, as the VR studio has the pose info not only on the stand itself, but also the HUD if you have that as well. * start searching through your stands for ones that are what you feel would be good for a work style AO – this may vary dependent on the style of work you do. You will need 5 stands. * You can then do this four more times, once you pick four more animation stands you like . * As you collect each stand or animation going down the card to fill it all in, you can drag and drop the animation from your inventory into the Zhao II you have rezzed on the ground in front of you . 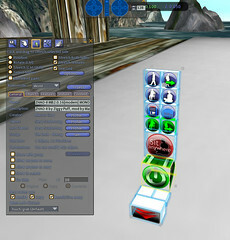 *Moving on to walking, because of the interface of the Zhao II you can scroll between walks , sits etc at any time. So you can put in more than one in each category if that is preferred. Sometimes changing your walk is a lot more enjoyable in an AO. Also as there is a Sit anywhere function in this Zhao II which I love, making sure you have a variety of sits for it is good, it will pull from your ground sits line. You would either change stands, or choose the library you put the walks in, and continue from there. I get to stay put yay. That is where it can get even more fun, or at least overly organised. There is no need to have seperate AO’s you have to find and attach at different times. Due to the scripting of the Zhao II you can fill it with many animations and settings notecards and then swap between them at the click of a button. So if you don’t want to change or choose, you can just unpack and repack all into one as I did with some other AO’s that all used the Zhao II system already. All I had to do was unpack and drag all animations and notecards into the one, and the scripts did the rest. ( make sure you don’t drag the scripts from one to another, as it will cause errors ). Now all I have to do is leave my VR Studio stand in a safe place, and I can add to the libraries as I go, and any time I feel like a change of AO I am prepared. I really hope this helped some confusion with how to do this, I have helped many in the past with work or friends, and I think once you get the hang of it it can be fun to play with often. For this example I used the ZHAO-II MB2.0.16[modern] MONO option as there is more than one in the folder you get from Grays. VR Studio can be found at VR Foundry Main , or VR Foundry @ The Deck for the non age verified :P.